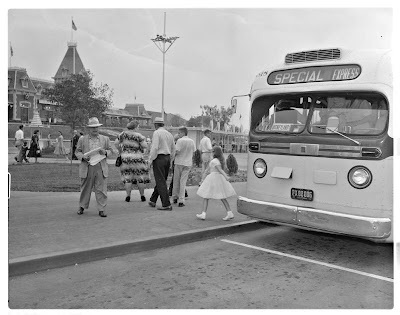 Today’s post is a follow up too last week’s Magazine Monday post “Take a Bus to Disneyland” (link). 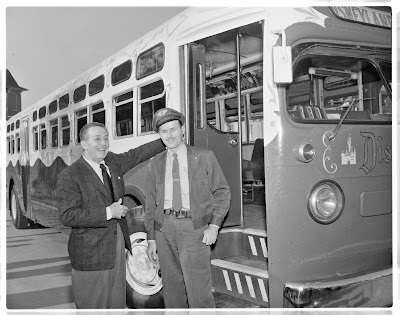 My good friend at Disney on Parole found this amazing collection of MTA archival photos on Flickr and shared it with us, thank you! 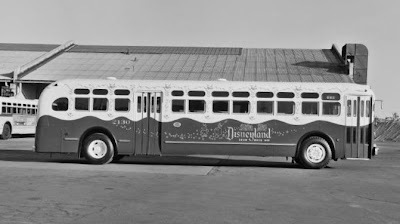 The entire 45 picture MTA/Disneyland collection can be found at Flickr here (link). 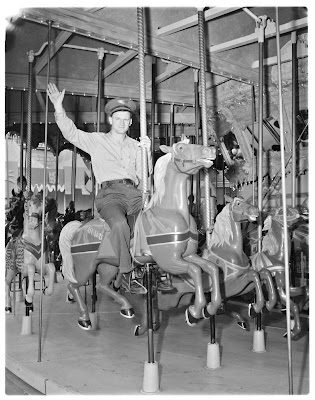 Here’s a set of photos from November 19, 1955 that were taken for the article in my post of last week. 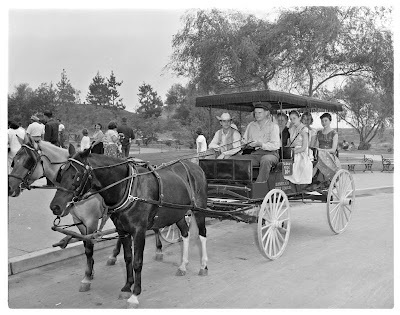 This last one from November 19, 1955 claims to be at Disneyland, anyone know where this is/was? 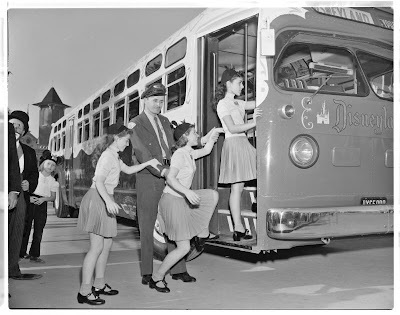 This set is from is from August 12, 1955 and appears to follow around some of the MTA drivers. Thanks again to Disney on Parole! Welcome to Magazine Monday. 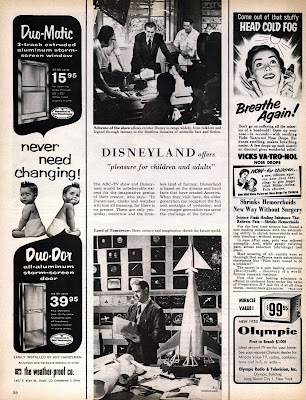 “Look”ing way back to November 2, 1954, this issue of Look Magazine has an early article on that new idea called “Disneyland”. 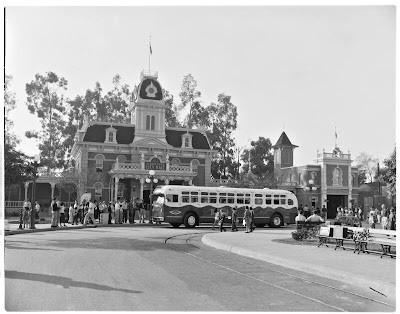 There are no construction or attraction photos in this article, just the big map Walt used to sell the idea of Disneyland. I tried to put the two pages into one file, but it just wasn’t working so I gave up. If you want to assemble them yourself, the full size high resolution scans can be downloaded here (Left Side/63mb – Right Side/67mb). 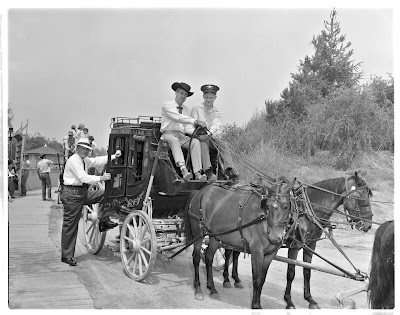 Talk of “International Street” way back then! 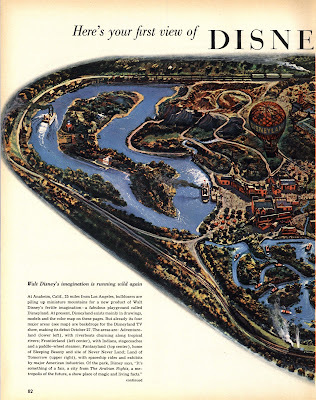 From the description, it sounds like what became World Showcase at Epcot. “For teachers and pupils to discover greater ways of understanding and education” Interesting. 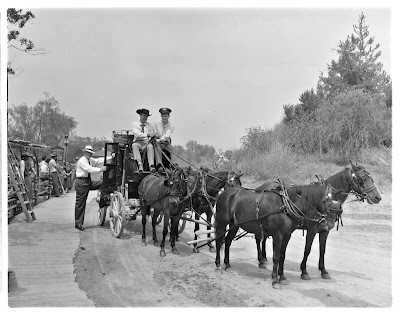 There sure was a lot of focus on the midget horses in these old articles. 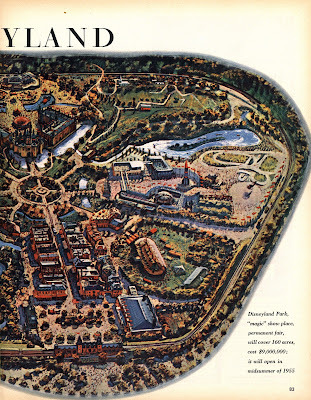 Do you suppose that’s really Frontierland in the lower left photo? I’m thinking it's the Studio Lot. Nice Toaster! There’s a bunch of great articles in this magazine, but there are even better advertisements so I just picked out a couple of the articles. 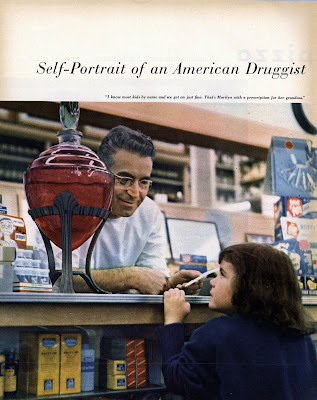 This one reminds me of the Upjohn Pharmacy at Disneyland! 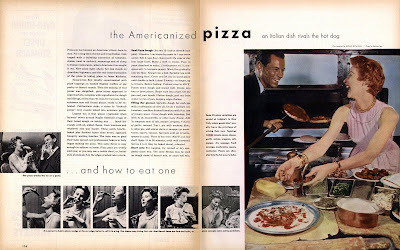 “The Americanized Pizza” I love pizza and they sure are making it look fun too! 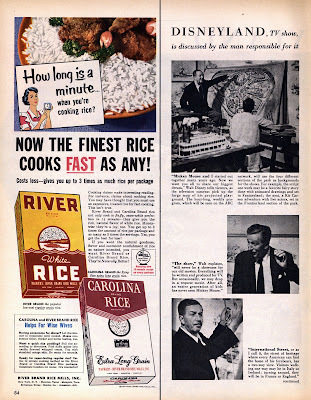 There were so many amazing vintage ads in this issue it was hard to narrow them down to just these few. Let’s start of with some celebrity endorsements. 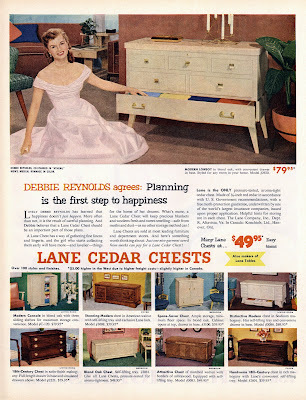 Debbie Reynolds didn’t even get off the floor to sell these fine Lane Cedar Chests. I’m not sure I would buy a shirt from this guy, it might explode when you put it on, I hear he can be quite the Joker! 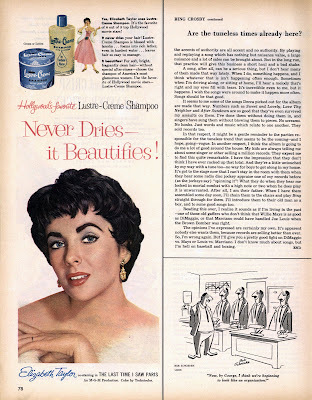 Elizabeth Taylor selling Lustre-Crème Shampoo is looking mighty nice. 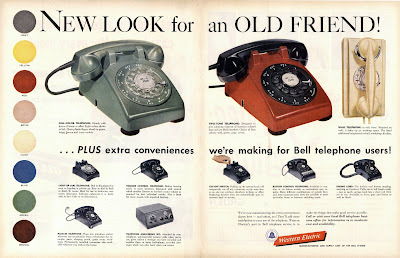 As a vintage telephone collector, this ad makes me weak in the knees. “Colors”, “Spring Cords”, “plug in phone” and a “Telephone answering set”, those ideas are crazy! 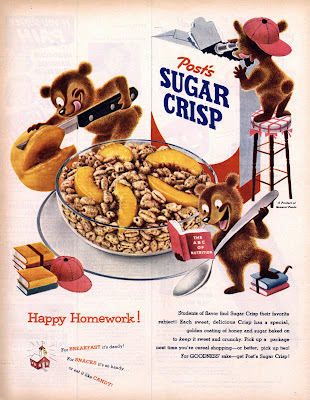 This Sugar Crisp ad is just marvelous, how fun! 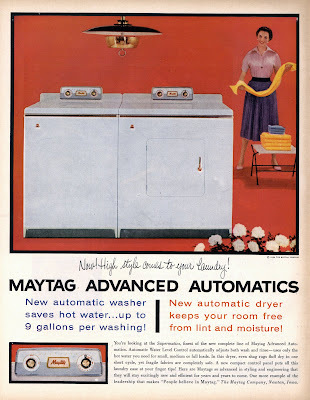 These Maytag Advance Automatics look “tank tough” I bet there are still some in service. 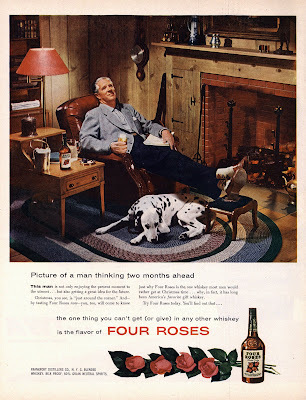 How about a few vices’ for our last ads? Smoking is bad, don’t do it, it’s gross, what are you crazy? 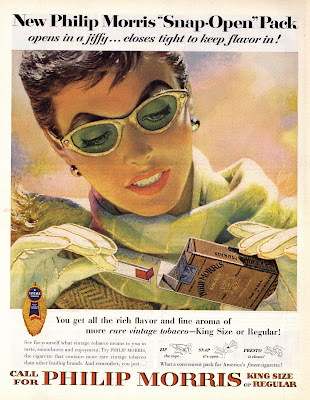 That said, WOW, check out this lady, she is so pretty and trendy looking, no wonder people thought smoking was cool, she's stunning. Back to my alternate universe, this is me on European Vacation. And this is me at home relaxing with Spot taking a rest on the carpet! Welcome to Bonus Sunday. Today we’ve got a neat little catalog. 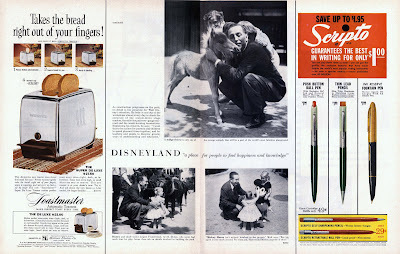 “Schwinn takes a Trip to Disneyland". Here's a few select pages. 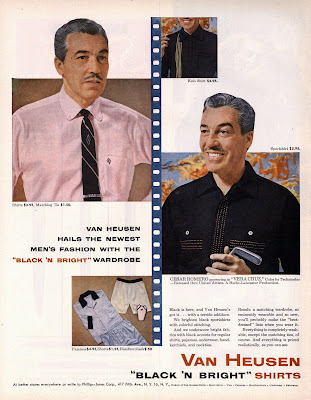 On Friday’s post I couldn’t find the date for this catalog, well heck, it’s right on the first inside page! 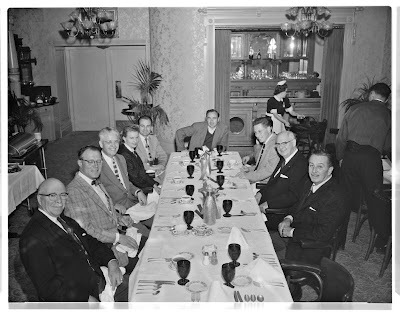 Maybe I need glasses… "Copyright 1966", however, I think these photos were taken in 1965, check out last photo in this post. “Ask any Mermaid You Happen to See... What's the Best Tuna?” Chicken of the Sea of course! These bikes are great! 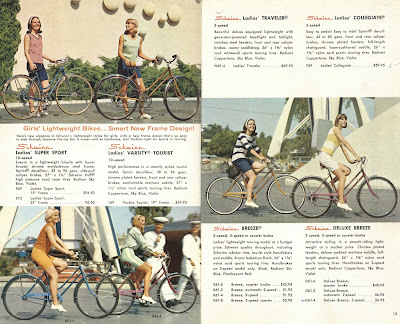 This set of photos has pretty ladies, pretty bikes and the “old” Tomorrowland in its golden years, I love it! 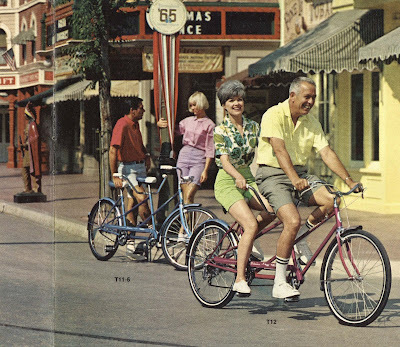 From the tandem bikes section on page 15, this Main Street photo reveals it was taken in 1965. 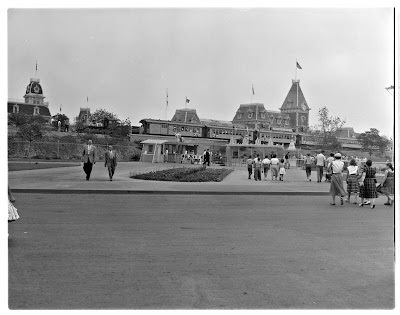 I imagine the rest of the photos are from 1965 as well, probably the fall when the park was closed Monday’s and Tuesday’s. 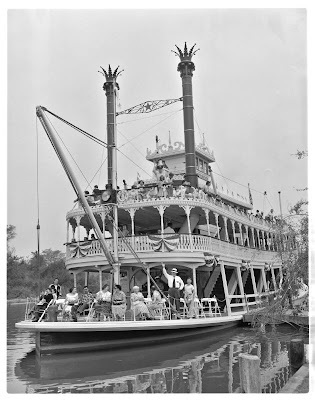 I hope you download and enjoy Schwinn;s trip to Disneyland catalog, there's some great vintage photos and some great vintage bikes. 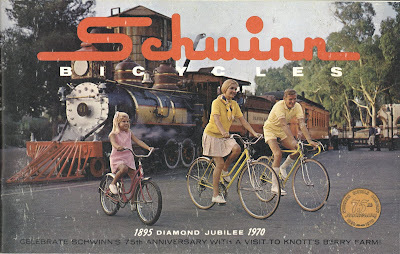 Check back next week for Schwinn's "Diamond Jubilee" Catalog from 1970 photographed at Knott's Berry Farm. 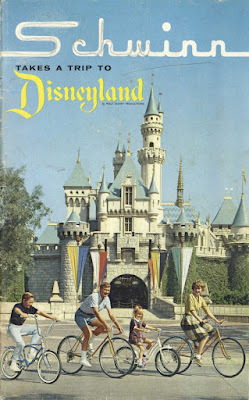 It's just as fantastic as the Disneyland catalog, maybe a little better because it has my first bike in it, a Sting-Ray in Campus Green with a "Slik" rear tire! Not to be confused with last weeks post (link) were Six Flags was “Building a Better Mountain”. 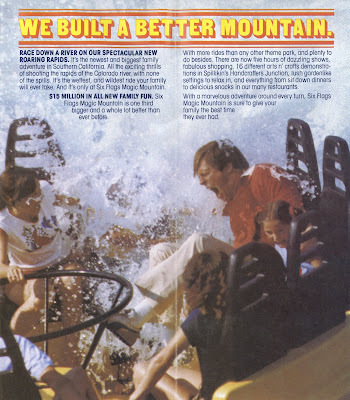 In today’s post from 1981 Six Flags has done it, yup, they “Built a Better Mountain” and it only took a year! 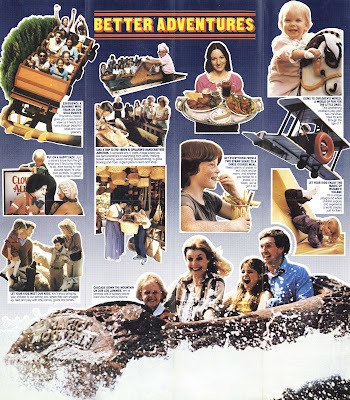 It’s interesting (to me at least) to note that last weeks brochure from 1980 made no mention of the new Roaring Rapids, now open in 1981. You are guaranteed to get wet on this ride. Anywhere from “My shirt is wet, it feels good and dries in 30 minutes” to “I’m soaked down to my socks, shoes and underwear, this is going to be a long squishy day”. Better Rides, Better Shows. That Steve Martin puppet is not a “wild and crazy guy”, he’s more like a demon from Puppet Master! Barbara Mandrell, I’m starting to miss the 80’s. And there’s the brand new “Buccaneer”, it was only an artist conception in 1980 (link). Better Adventures! Do you get the feeling Magic Mountain is “better”? Spillikin’s handcrafters, what fun, candy making and yes, basket weaving! 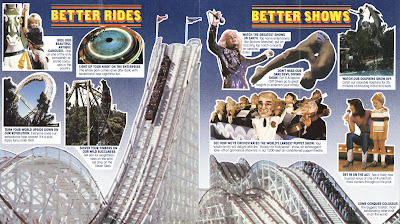 That food on the silver platter looks a lot “better” that the food from the 1980 brochure (link). 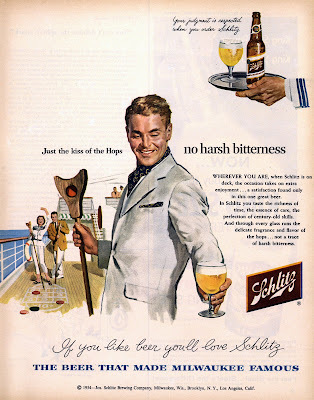 “Only two Gallons North of Hollywood”. 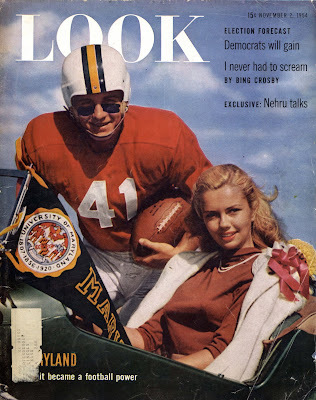 I guess they dropped that tag line some time after the fuel shortages of the 70’s. If your into the Magic of the Mountain, be sure to check out all my previous posts here (link). This week’s worth of posts had no Bonus Sunday teasers, so here you go. 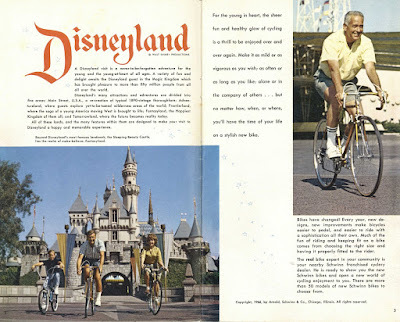 This is the center fold from a great 1965/66 "Schwinn takes a trip to Disneyland" catalog. If you haven’t seen it, it’s really amazing. 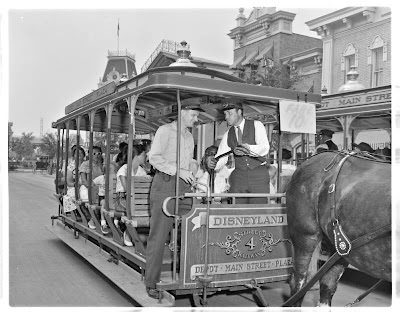 It has 36 pages with tons of photos almost entirely taken at Disneyland (on a closed day obviously). 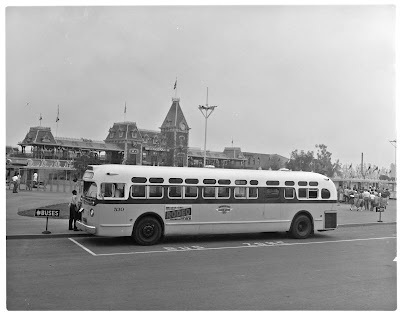 I can’t find a date, but “66” is written in pencil on the back and this photo is somewhat rare in that it’s the “Old” Tomorrowland (55'-66') with the “New” square Skyway buckets (65' to 94'). 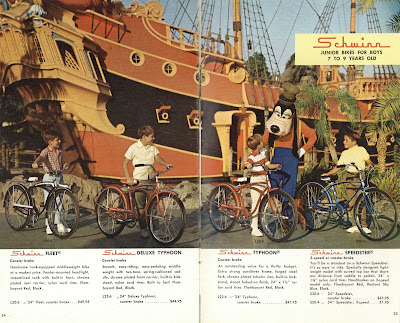 Come back on Bonus Sunday for the entire “Schwinn takes a trip to Disneyland” catalog. P.s. 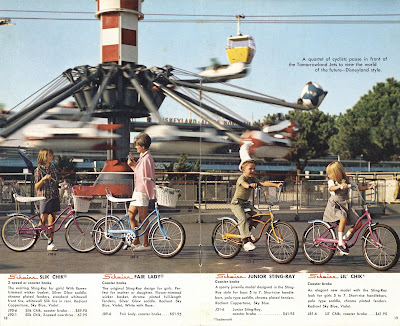 As a future bonus Sunday teaser, I’ve also got a Schwinn Catalog from 1970 photographed entirely on location at Knott’s Berry Farm. 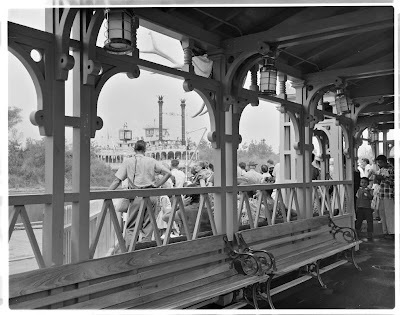 Imagineeringland Today - November 15 & 16, 1997. I have no idea what this is about other that what you see here. 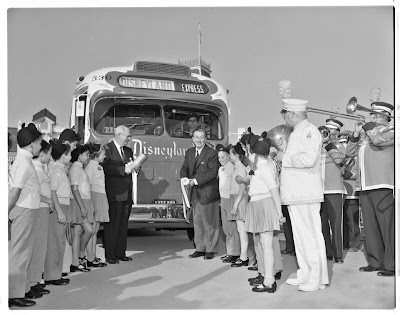 As a Disneyland fan you’d think I would be more up to speed on this stuff. I guess it’s self explanatory, looks like an event for Imagineer’s and maybe their families? The brochure neglects to mention where this event takes place but I guess if you're invited, you'd know where it is. Hmmm, interesting pictures, I see Test Track on the upper left, that's a fun ride, too bad the poor Rocket Rods didn’t come out that way. Here’s a close up of the DCA concept art, looks close to what came out, I think. Lots of fun things to do! I would head right to Bonusland (fun word!) 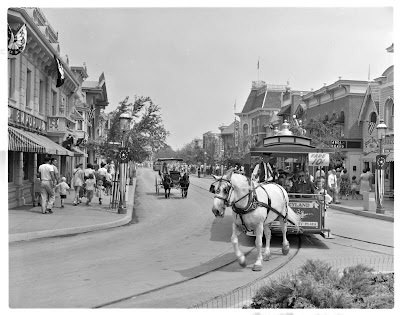 and have a long discussion with the Imagineers regarding the Rocket Rods and the use of banked roadways. Don't they know the coefficient of friction is vmax = m/s = mi/hr = km/hr? 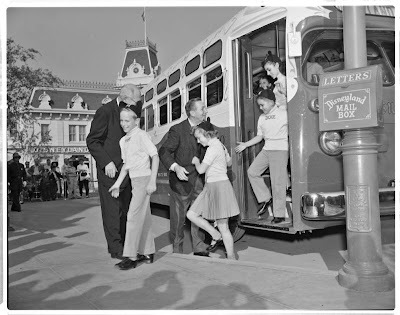 Were they nuts trying to use the flat PeopleMover track?. 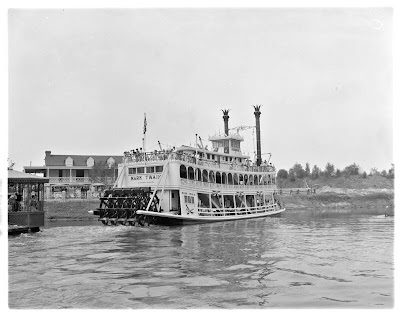 They "imagineered" failure for the Rods by going cheap.